We trace our heritage back to 1967 when a group of citizens, including Frank and Frances Robinson, founded the Friends of Newport Bay to call attention to the ecological importance of the Bay and to enlist broad support for the retention and protection of the Bay in its relatively natural state. The Friends was at the forefront of environmental education, conducting monthly nature tours at the Bay starting in late 1968. “Friends Tours” are still given by us at what is now Vista Point on the second Saturday of each month from October to March. 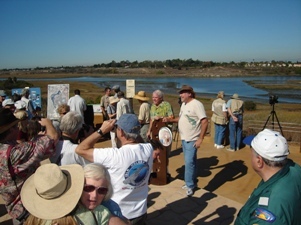 As a result of the efforts of the Friends, the Robinsons and others, the Upper Newport Bay Ecological Reserve was created in 1975. Additionally what is now known as Upper Newport Bay Nature Preserve was established on the neighboring bluffs in 1989. The Upper Newport Bay Naturalists was formed in that year to organize and conduct restoration, education and other activities on behalf of the agencies managing the Ecological Reserve and Nature Preserve. In 2000 the Friends and the Naturalists merged to become the Newport Bay Naturalists & Friends. Since then we have grown greatly in stature, and in 2010 our membership elected to change the name of the organization to the Newport Bay Conservancy. The new name reflects our increased experience and capability to help protect and preserve Upper Newport Bay. Our mission remains the same and we will continue to work in partnership with the California Department of Fish and Game, the City of Newport Beach, Orange County Parks and the many other stakeholders involved at the Bay and in its watershed to accomplish our mission. We will continue to build a reputation for innovative, collaborative thinking and develop the capability to devise and help implement sustainable, integrated solutions to watershed problems in a timely, cost-effective and professional manner. We will promote science, economy, efficiency and improved service in the transaction of business within the watershed. We will take on programs and projects that are important to Upper Newport Bay and strive to execute them with the passionate dedication of a volunteer-driven organization.